Taking advantage of Halloween's extension into the first weekend of November, Hollywood Gothique went on supplemental Halloween Haunt Odysseys on Friday and Saturday, enjoying spooky encounters at Hollywood Haunter's Grave Rock Gulch, Rotten Apple 907's Haunted Wilsley Manor 2, The Haunt with No Name Yet, and the House at Haunted Hill. 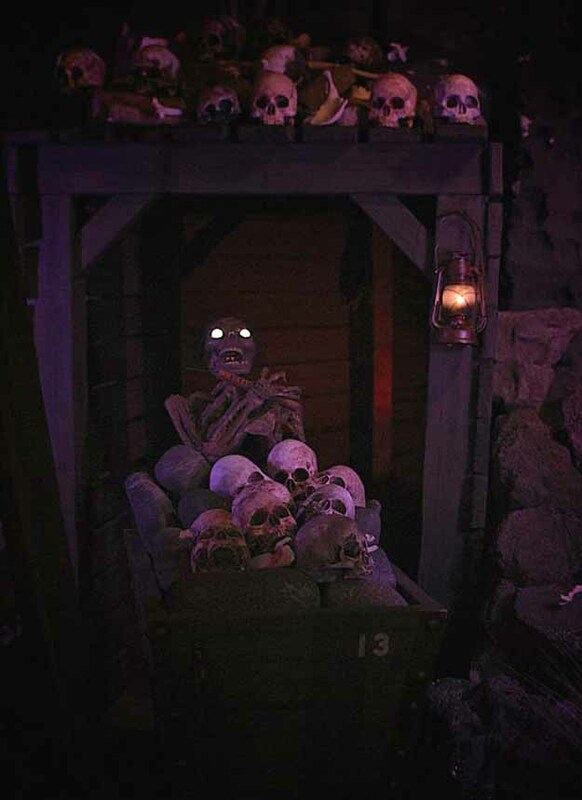 Although we have covered most of these haunts extensively in the past, we wanted to offer a few comments here, especially for House at Haunted Hill, which remains open on Sunday night, providing one last exhalation of ectoplasmic entertainment before the Halloween season finally draws to a close. The trick to reviewing this elaborate yard haunt is that its rococo richness of detail is so overwhelming that it's easy to forget exactly what one saw from one year to the next. Although the overall presentation remains the same for Halloween 2013, several details seem new. As long-time haunt-chasers know, The House at Haunted Hill literally tells a story, with dialogue, narration, and music: the first part takes place in front of the house, depicting upcoming actress Julietta's marraige to a shady movie star; the second part moves to the cemetery on the side of the house, where we see Julietta's tragic fate, trapped for eternity. 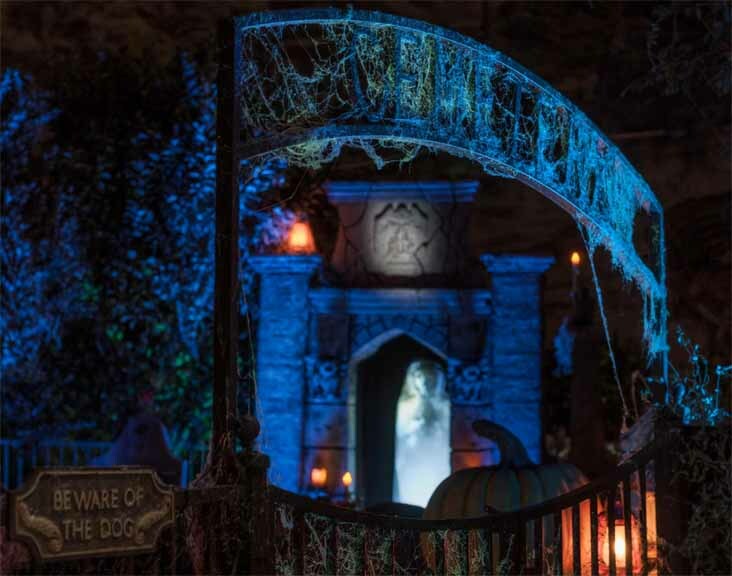 Over the course of the past year or two, the arrangement of special effects and props in the cemetery segment has been changed to focus attention better. For example, the skeleton who exhorted visitors to listen while he told the tale of the "man with the hatchet" has been removed from his old rocking chair and placed on a tomb farther back, so that as you are looking in his direction, your eye is properly placed to see the silhouetted shadow of the hatchet-wielding man on the hill in the background. We can't recall whether last year we saw the ghost that emerges to float over the cemetery, but it's a great touch and worth seeing. For us, the most vivid impression this Halloween was the degree to which the House itself has become the star. For the past few years, projection effects have been used on its facade, but in the past the were mostly filler in between shows: a little atmosphere, an occasional bat flitting past the upper story. Now, the effects are fully integrated into Julietta's story, first to depict the house as it looked in its glory during the silent movie days, then to showcase its horrifying transformation: when a vengeful ghost arrives to destroy Julietta's happiness, the house literally seems to crack and crumble before our eyes. Absolutely amazing! The House at Haunted Hill resurrects its spirits one last time this Halloween, tonight from 7pm to 10pm, at 4400 Saltillo Street, Woodland Hills, CA. There is no charge, but donations are accepted. Crowds have thinned out, but parking is still at a premium, and the street around the house is blocked off, so be prepared to walk up the hill. Visit their website for more information. 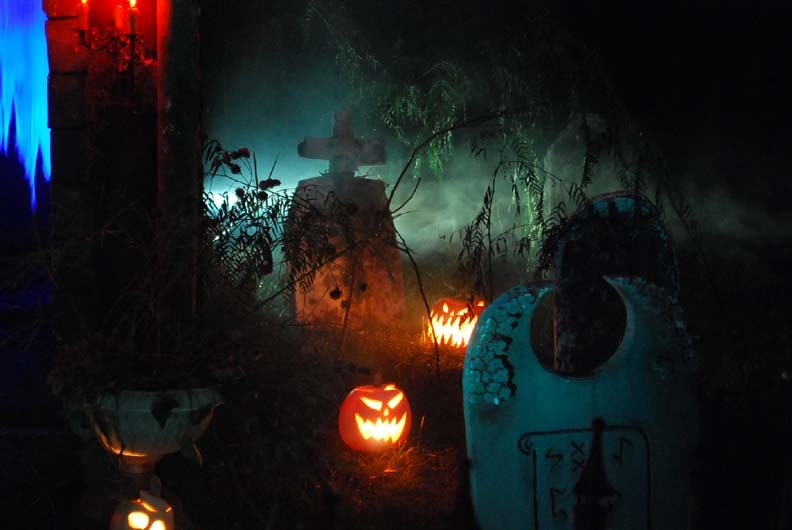 For the past few years, when Hollywood Gothique visited this subtle, spooky yard haunt in Tarzana, it was usually a day or two before Halloween, often on a "preview" night before the full haunt was ready. Which is a shame, because the trademark of the Haunt with No Name...Yet is a marvelous variety of hand-carved Jack O'Lanterns, which are never fully completed until October 31. We spotted one or two new effects last night, including dangling flickering lights, suggesting a will-o'-the-wisp in the foliage surrounding the house, but the highlight for us was once again seeing the effectiveness of the old-fashioned, hands-on approach to Halloween. The Jack O'Lantern is an iconic tradition of the Halloween season, and no other yard haunt in Los Angeles does them so well. Unfortunately, carved pumpkins do no last long before shuffling off their mortal coil; consequently, the Haunt with No Name...Yet has closed for the season. Be sure to check it out next Halloween. It's low-key but quite marvelous and never as crowded as it deserves to be. Their website is here. As it was last year, the highlight of the Haunted Wilsley Manor 2 is the vertigo-inducing upside-down room, and this year it's even better. 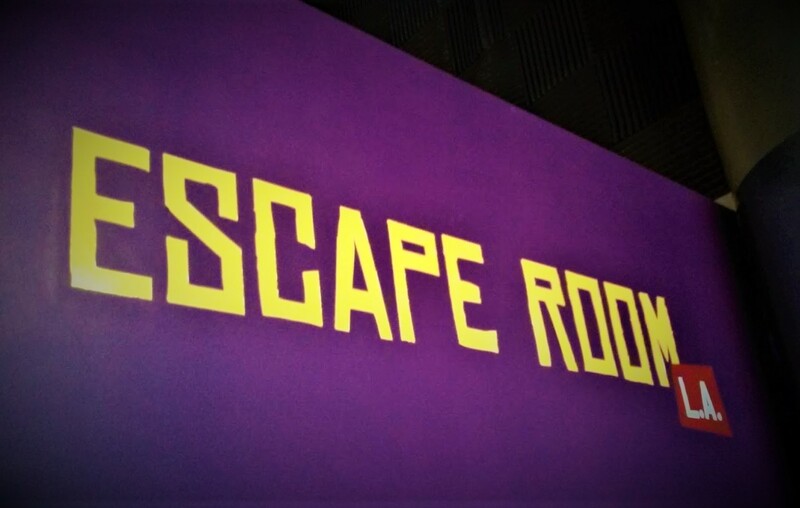 The set is designed to make it appear as if you are walking on the ceiling. A couple of unfortunate bodies are trapped there with you, clinging tight, while a dinner table floats over head with a dead dinner guest hanging head-under-heels, and the trance induced by the weirdness of this wholly unusual perspective is shattered by the sudden smash of a body hitting the outside of a window in the background. But all of that you could see last year, and it fades to insignificance when the scene's punchline hits: what appears to be a dead butler, hanging from the "floor" (which, remember, is overhead in this room) suddenly springs to life and walks toward you - but because he's hanging upside-down, he's walking on his hands! Absolutely unexpected (the figure appears to be an inanimate mannequin until it moves), the effect is supremely startling and absolutely incredible to see. We just wish we had seen it in time to alert you to its brilliance! 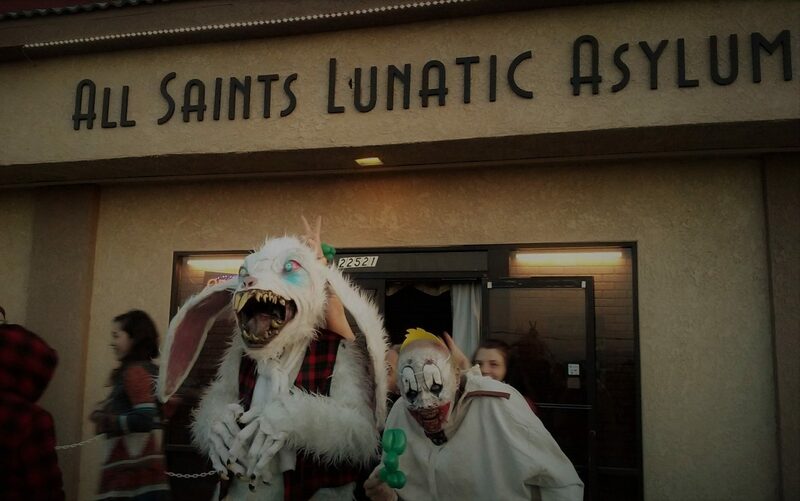 Oh well, maybe it will be back when Rotten Apple haunts Burbank again next Halloween. Check their website in September to see what they will be up to. Hollywood Gothique did a drive-by of this Glendale yard haunt a week before Halloween, to see the impressive facades creating the illusion of an old Western ghost town. On Friday night, we returned to walk the streets of that town, past the funeral parlor and train-ticket booth, pausing at the saloon (bone dry, unfortunately), panning for gold (well, body parts actually), and taking the opportunity to push the plunger on a detonator near the gold mine, initiating an explosive blast (well, a sound effect and some flashing light). 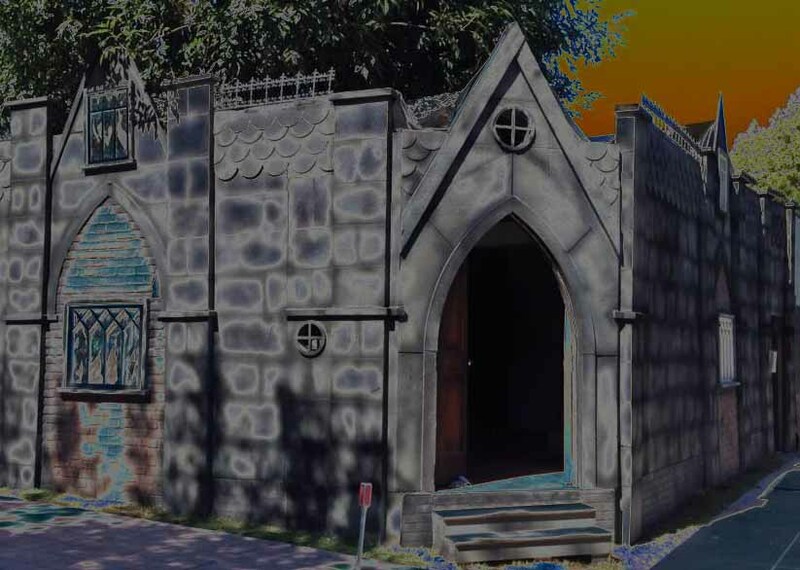 Unlike Halloween 2012, there was no scary walk-through this year; the old cemetery-mortuary theme is gone, replaced by an approach more appealing to young trick-or-treaters. The sets this year were even better than last year's work; walking through the front yard was like entering a mini-theme park. As impressive as it was, we understand the Western theme will be retired for next year; we can't wait to see what Hollywood Haunter comes up with next. Keep track by visiting their Facebook page.